Ludo is a simplified version of a traditional Indian board game, Pachisi. The board game Parcheesi is a variation of Ludo, and many other games are based on its principles. This quick-playing game requires two to four players. 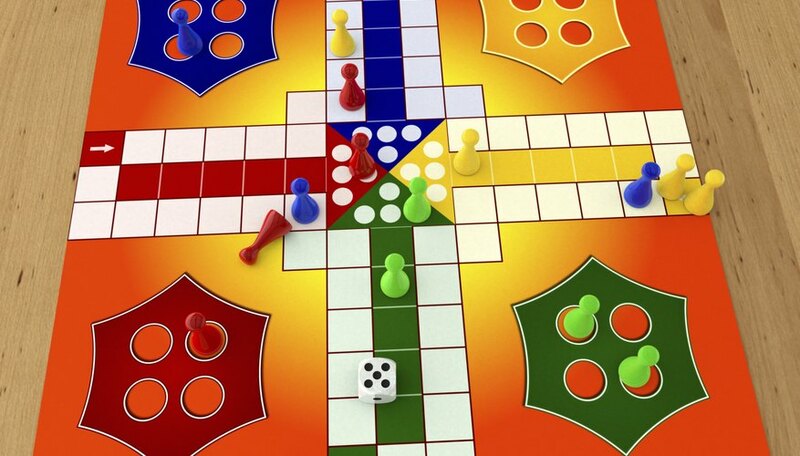 A Ludo board has four starting areas of different colors, each of them with space for four pawns. The main part of the board consists of a cross-shaped arrangement of four tracks leading into a goal area in the center. Each track consists of three rows of eight squares, with the central row the same color as the nearby starting zone. There is also a single colored starting square connecting the row to the starting zone. Each player chooses four pawns and sets them up in the four spaces of the starting zone. Players choose who will go first by rolling a die. Beginning with the player who rolled highest, each player rolls a single die to move a piece. Moving a piece out of the starting area requires a roll of six; if no piece can move, play passes to the next player. Once a player has pieces out, she must move one of her pieces clockwise around the track. The piece must move the number of spaces rolled and cannot move fewer. If the player has more than one piece on the track, she may choose which piece to move. Pieces move around the outside of the track's "arms" until they complete a circuit of the board and return to the track of their color. If a player's piece lands on a square which is already occupied by another player's piece, that piece is knocked off the track and returns to its starting zone. However, if it lands on a piece of the same color, the two form a block. Pieces of other colors can't pass through or land on this square. Once a piece has returned to its original arm and made it to the entrance of the matching-colored track, it begins to move toward the goal in the center of the board. To reach the goal, the player most roll the exact number of squares the piece would need to move. If the goal is four squares away and the player rolls a five, for example, she must move another piece or pass. The first player to get all four pieces into the goal is the winner. Although there is some skill involved in Ludo, it is still largely a game of chance, with one of the most frustrating random elements being the starting roll. To speed this up, some players change the starting roll to a one or six. In some versions, landing on the final space is even harder -- players who can't move another piece and have rolled too high must move their piece up to the final square, then turn around and move the remaining number of squares back. This tends to delay a player's last piece, hopefully giving other players a chance to catch up.